0 Comments Published by Jane on Sunday, September 06, 2009 at 10:42 AM. The Boston Globe mentioned that the 1919 Command Log has recently been scanned and uploaded to the Boston Public Library website. The year-long log covers a period of chaos in Boston when a large number of the force went on strike and the city became over run by armed gangs. My Great-Grandfather, Maurice Sullivan, was appointed to the Boston Police force on February 23, 1889. He was 26 years old at the time and this was a second career for him. By the police strike year of 1919 he was 57 years old and a thirty year veteran. While reviewing the log, I believe I found two mentions of my Great-Grandfather. In one notation, he is approved to accept a reward for capturing a runaway and in the second he is transferred from Headquarters to Division 1. It is the transfer that I find most interesting. By the time Maurice retired from the police force in 1932, he was famous for having served his entire long career at just one station house - Division 1 in the North End of Boston. In the book Boston Police Department (Images of America: Massachusetts) he is even pictured in front of the division house. 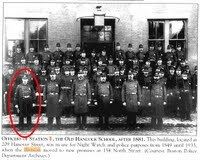 But during the tumultuous year of 1919 he served at least some of his time at police headquarters before returning back to his division house and familiar neighborhood patrol.